The Gamma Deuteron Charge at the University of Michigan was re-chartered in 2009. In 2016 the Charge took home the Victory Cup, top honors for the highest score on the ROV (Report of Visitation). This means they exemplified what it means to be a top Charge in the following categories; brotherhood, scholarship, leadership, and a responsible social life. As part of the Grand Lodge’s new vision they have redefined what a responsible social life means for the Charges of Theta Delta Chi. Rather than just focus on philanthropy the new direction is to focus on service projects as well. The signature service program of Theta Delta Chi is Bros UniteD. Bros UniteD was founded at the Lambda Triton Charge at Rutgers University. The program pairs teenage boys on the spectrum and the brothers of Theta Delta Chi for weekend hangouts throughout the semester. The success of the program at Rutgers made it an obvious initiative to bring to the rest of our Charges. It is a distinctly visible project that gets the men of Theta Delta Chi involved in communities outside their campus. Over the course of the semester the big and little bros make meaningful relationships and socialize in a relaxed setting. The program has been supported with grants from our Educational Foundation. Our international philanthropy partner Autism Speaks has been instrumental in providing resources and local connections. 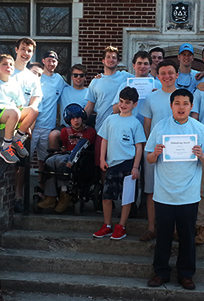 The Gamma Deuteron Charge had their Bros UniteD efforts highlighted on the Autism Speaks blog in October. To learn more about the program and see the article written by Brother Stephen Collins click here!